We designed a range of artworks from which the client made a selection of the more functional elements. The chosen work drew on fossil ammonites, found in the area. In sculptural terms the spiral form recurs in the nine cast stone wall copings, two carved Portland stone ammonite shells and also the oak seating - two ammonites and a ‘Curlicue’ seat. The artists made the original for the cast stone ammonites in direct plaster. 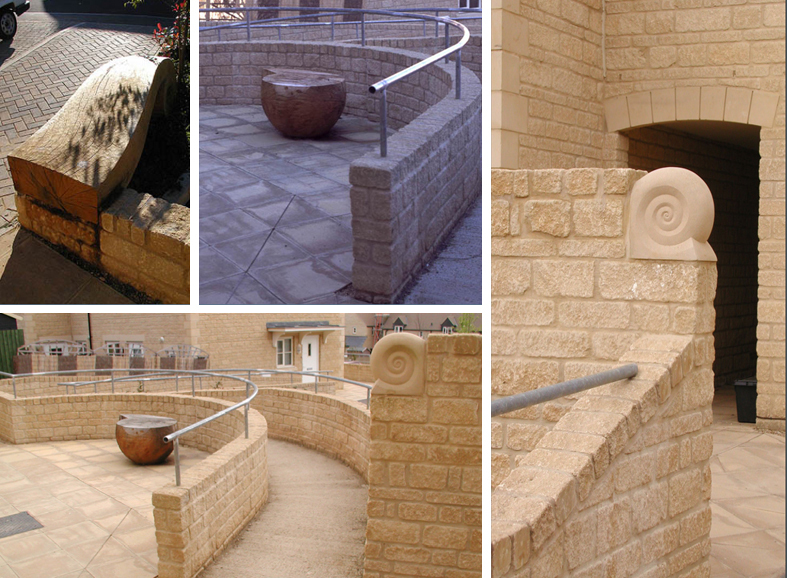 Castle Fine Art Foundry made the mould and Hampton Stone Ltd cast the nine ammonite stone wall copings. The timber was supplied by Ron Rose Timber. Phil carved all the stone and the majority of the wood with some assistance from Diane.